Discovering Biological Science weaves together a series of inquiry-based laboratory experiments that explore important introductory biology concepts and provide students an understanding and appreciation of the collaborative, creative and dynamic nature of science. Lab experiments center on issues relevant to students’ lives, are structured around the cycle of learning, and informed by both learning theory and the scientific process of discovery. The curriculum in each of the two volumes was designed to provide guided practice as well as feedback to students on thinking scientifically. 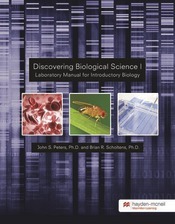 Discovering Biological Science is also unique in the author-provided instructional support materials, which are designed to help instructors who are new to teaching inquiry-based, student-centered labs. The two different laboratory manuals, which are suitable for both majors and non-majors courses, can be adopted as-is or customized to fit instructor needs.